In the News: MTSU’s 'Dolly pro..
For old and young alike, MTSU Homecoming 2016 featured lots of fun pregame events Oct. 15, including the annual parade down East Main Street, children’s activities and plenty of food and drink at tailgating, alumni and departmental lunches. Fans, cheerleaders and the Band of Blue greeted the Blue Raiders during the Raider Walk. 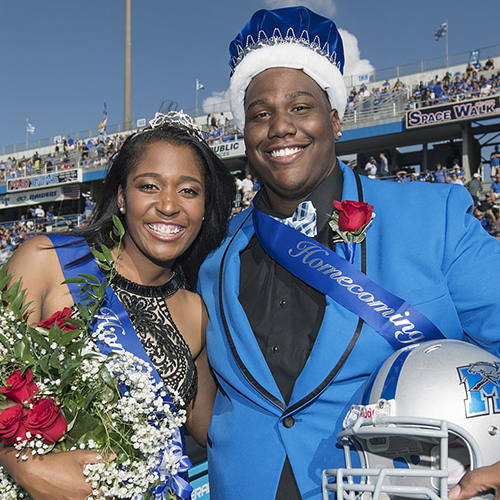 Surrounded by previous recipients, the 2016 homecoming king and queen, Denarius Stinson and Megan Berry, were crowned during halftime festivities. Conference USA rival Western Kentucky played the role of spoiler, emerging with a 44-43 double overtime victory in a game decided by a missed extra point. Playing off the popular Monopoly board game, “Raideropoly … This is How We Roll” is the 2016 MTSU homecoming theme. Following fall break for students and faculty, homecoming week events kick in Wednesday, Oct. 12, and conclude with the 1:30 p.m. Saturday, Oct. 15, game against Conference USA rival Western Kentucky in Floyd Stadium. Chili Cook-off — 6 p.m. Thursday, Oct. 13, in Floyd Stadium. Pep rally — 2 p.m. Friday, Oct. 14, in the Student Union Commons. Golden Raiders Society featuring Class of 1966 — 10 a.m. Oct. 14 in the Sam Ingram Building MT Center (RSVP to 615-898-2922). Distinguished Alumni introduction — 4 p.m. Oct. 14 in the Sam Ingram Building MT Center. National Pan-Hellenic Step Show — 7 p.m. Oct. 14 (ticket required). Mixer on Main Parade-Watching Party — 9 a.m. Oct. 15, on the President’s Lawn. Homecoming Parade — 9:30 a.m. (parade route goes down East Main Street, crosses Middle Tennessee Boulevard and turns left onto Baird Lane). Homecoming Tailgate Lunch — on the President’s Lawn following the parade (reservations required). Various departmental pregame tailgates also will be held. For complete schedules and more information, visit www.mtalumni.com and http://www.mtsu.edu/sga/homecoming.php. “Whether you graduated five months ago or are celebrating your Golden Raider 50th Reunion, it’s time to come home to Middle Tennessee,” King added. In this October 2015 file photo, MTSU students follow a truck-driven float during last year’s parade. This year’s parade, which starts at 9:30 a.m. Oct. 15, goes down East Main Street and turns left onto Baird Lane. The student kickoff event will be a first-time event — a glow paint dance party starting at 7 p.m. Oct. 12 at the MTSU RV Park near Greenland Drive. Murfreesboro Mayor Shane McFarland (Class of 197) will lead Saturday’s parade as grand marshal. Calling the parade at the MTSU Alumni Association’s 11th annual Mixer on Main will be Chip Walters (Class of ’85), the voice of the Blue Raiders, and Beverly Keel (Class of ’88), recording industry chair and music industry insider. Open to all, Mixer on Main will be a family-friendly place to watch the parade. Souvenir photos and children’s activities are planned, along with refreshments and music. Because of the Middle Tennessee Boulevard redesign project, MTSU officials urge attendees to exercise caution when crossing at intersections and while standing on the sidewalks, which are part of the construction zone, during the parade. The coronation of the 2016 Homecoming Queen and King will take place on the field. Past alumni recipients will join them.